Boba Fett's Helmet and Suit?? Message Boards - Boba Fett Fan Club → General → Boba Fett's Helmet and Suit?? Topic: Boba Fett's Helmet and Suit?? with the spash of Orange,. Re: Boba Fett's Helmet and Suit?? Well the thing is, a lot of time it isn't his armor, technically. I personally like how Mandalorian armor is so customized if thats what you meant. Assuming I'm following this correct, what you are describing are suits of armour like my own. 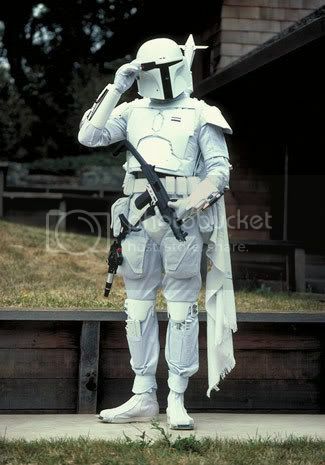 My costume (and those of many of the other KOTE Mandos) isn't Boba but a different Mandalorian Supercommando of the type described in stories by Karen Traviss and others. Despite the similarities, there's a big difference between doing a Mandalorian costume and doing a Boba or Jango costume. IF you are referring to the different types of Boba costume out there then bare in mind that there are in fact 7 distinct variations on the Boba costume (Albino Fett, PrePro I, PrePro II, Holiday Special Fett, Empire Strikes Back, Return of the Jedi and Special Edition Fett) all of them are Boba, several of them differ greatly in colour from the Fett in Empire and Jedi but all of them considered Canon. You mean there is a Albino[Bob] Fett LOL!! the screensaver under hear has boba fetts with all kind of different colour. not sure what this topic is about, but not till "Revelation" does Boba get true armor--Real Mandalorian beskar'gam. his other armor is osik'la durasteel. Blue silver and brown? Possibly is he mistaking Jango for another version of Boba? I am a bog fan of the ESB Boba suit. You got me. Sometimes my fingers miss! idk about you guys, but Boba Fett's armor PWNS!! !